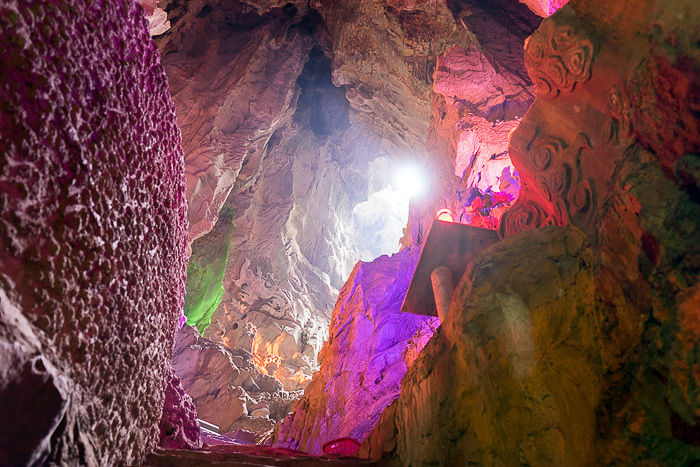 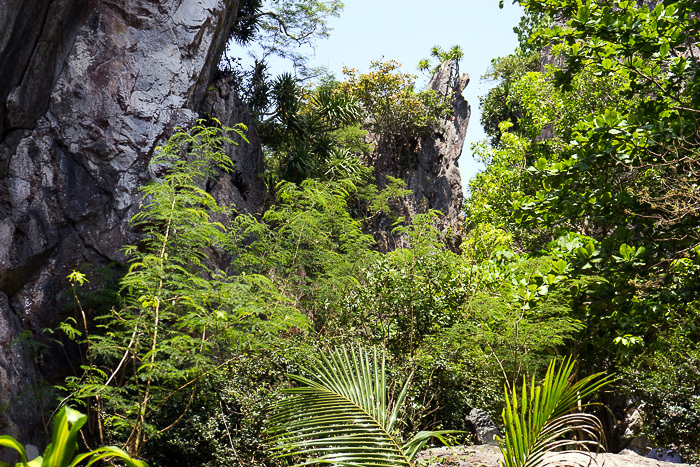 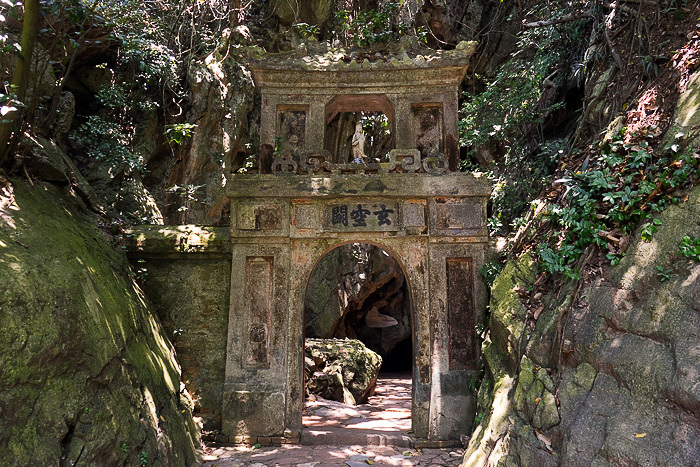 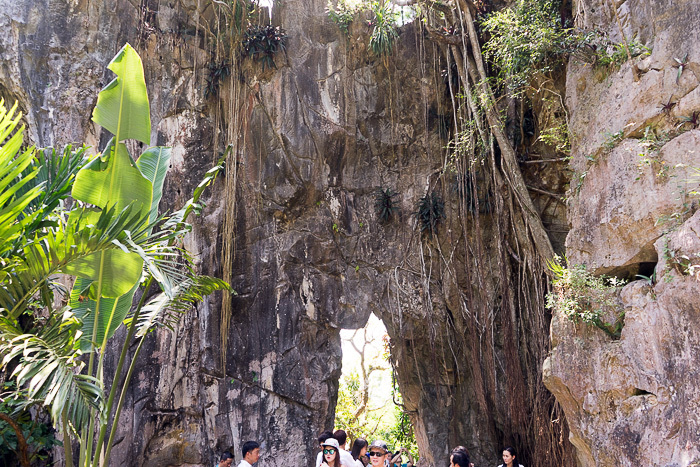 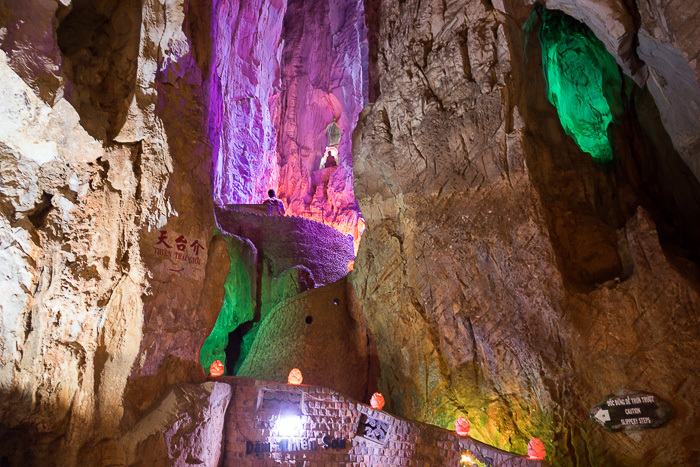 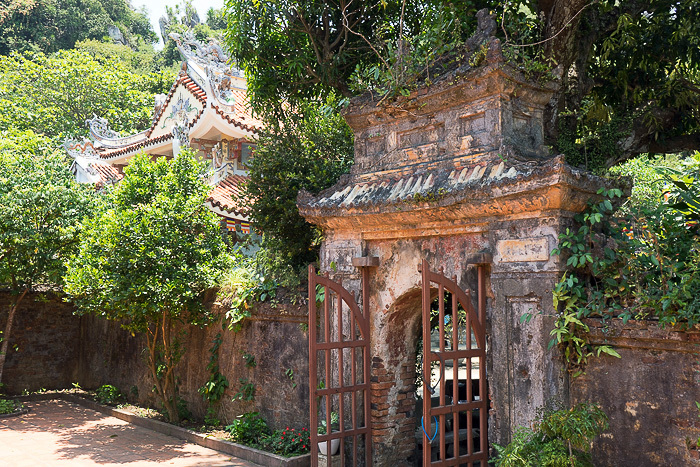 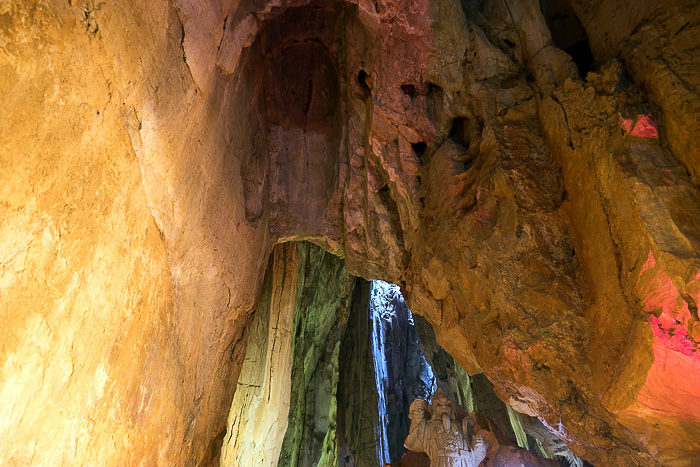 The largest of the Marble Mountains, and the only one with an official entrance fee, is the Water Mountain, Thủy Sơn. 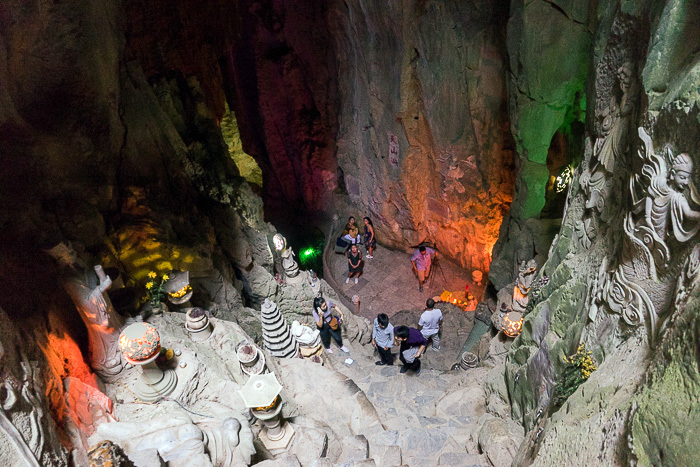 Before hiking up, we paid a little extra to enter a cave at the base of the rock. 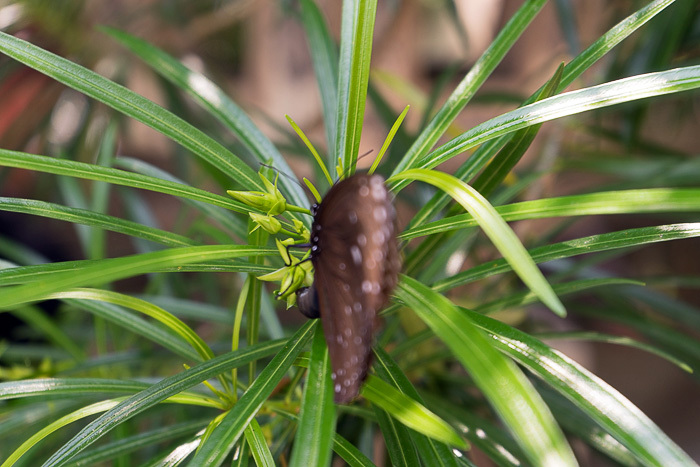 We were surprised by its size. 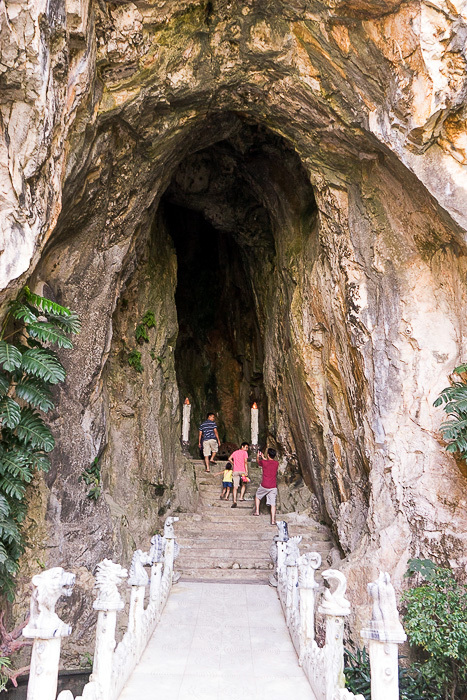 The Marble Mountains don’t look large, but they’re practically hollow. 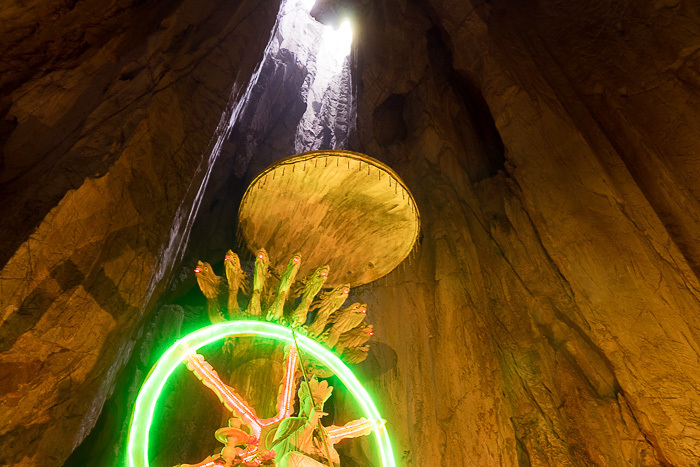 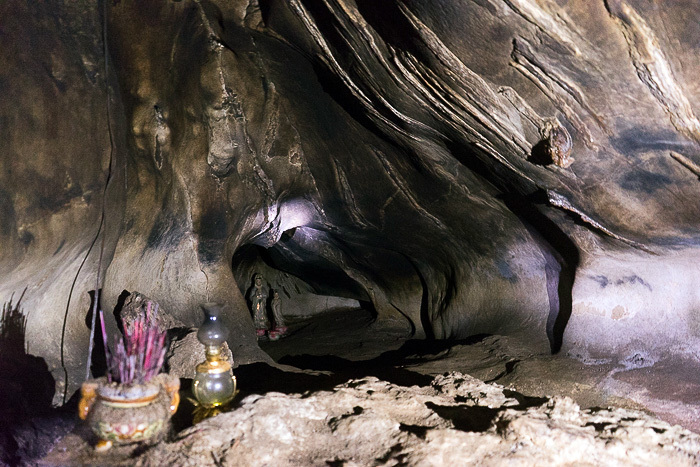 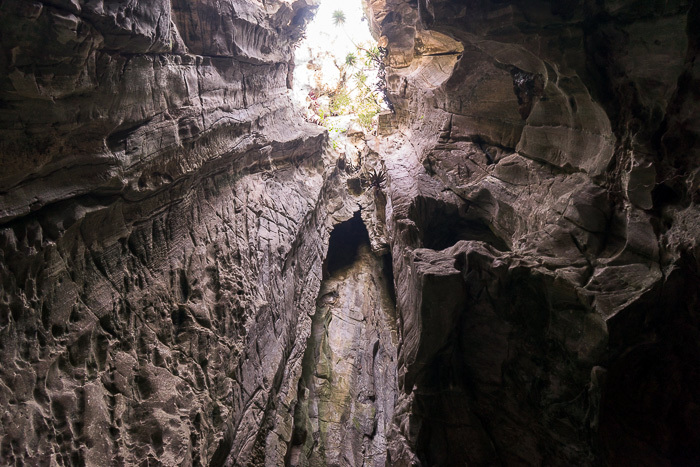 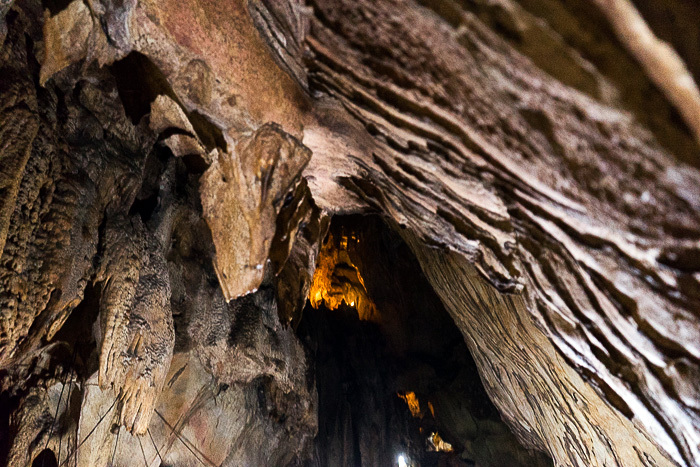 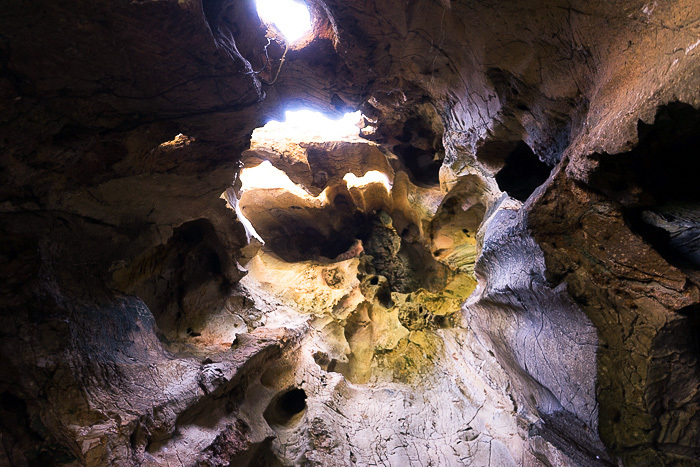 The roof of this cave went all the way up, and entering was like stepping into an enormous cathedral. 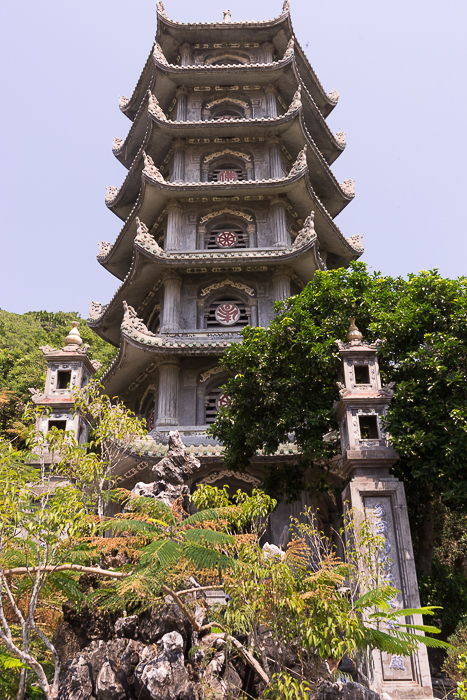 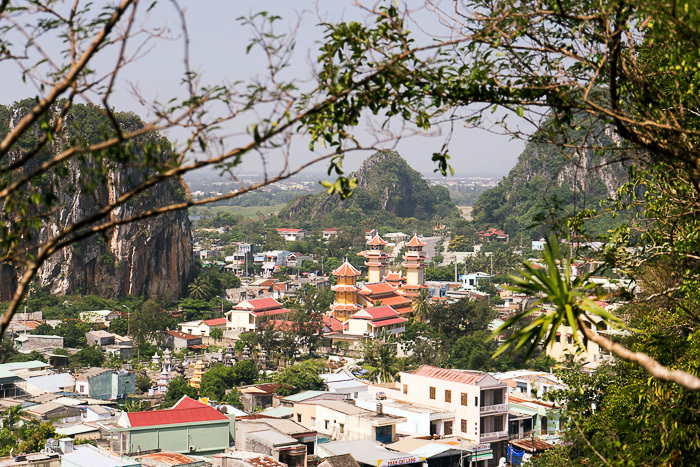 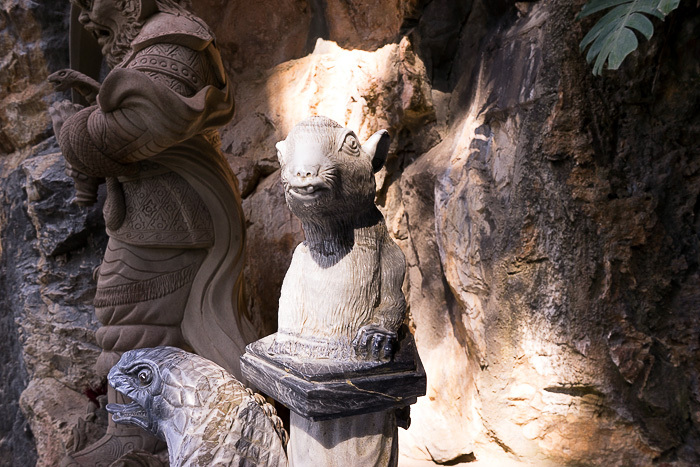 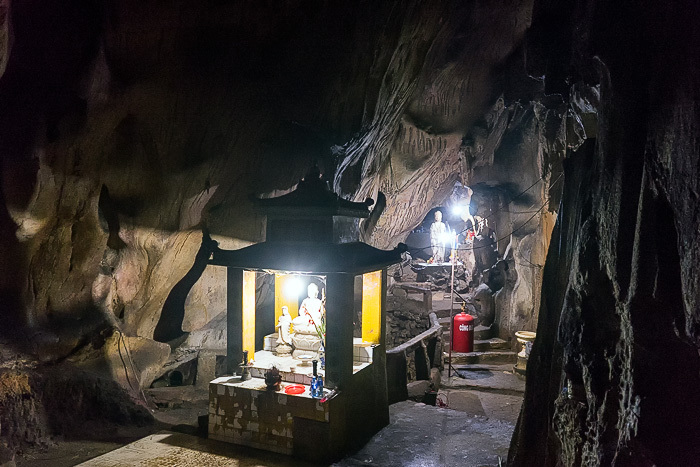 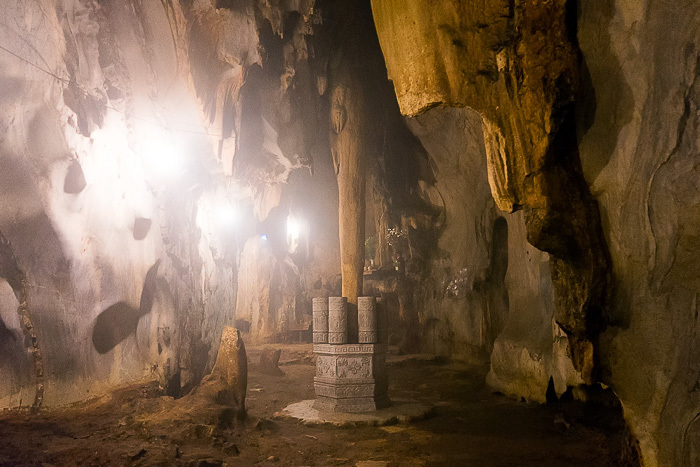 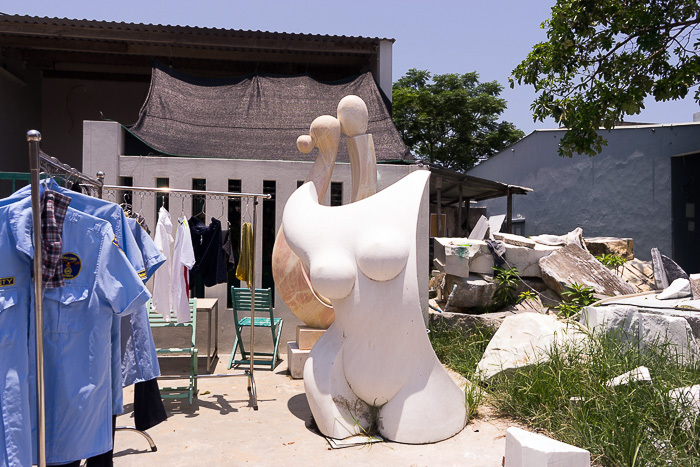 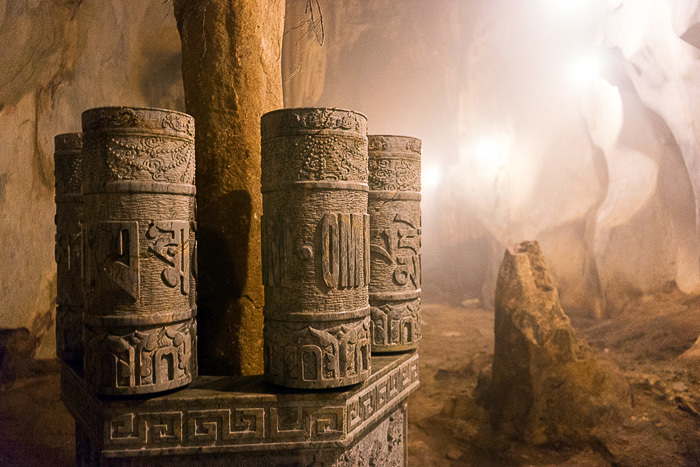 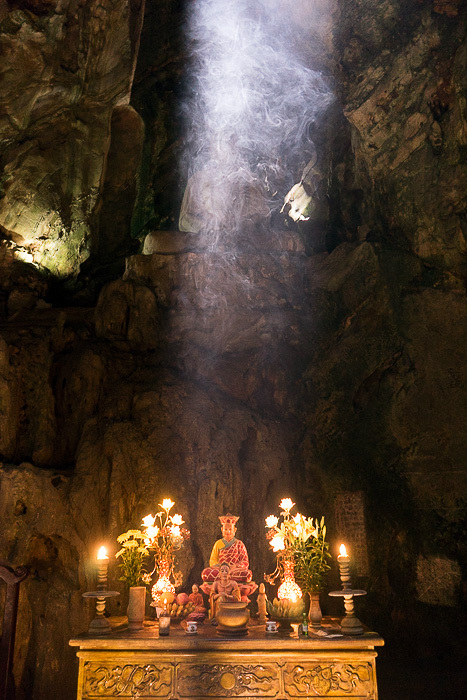 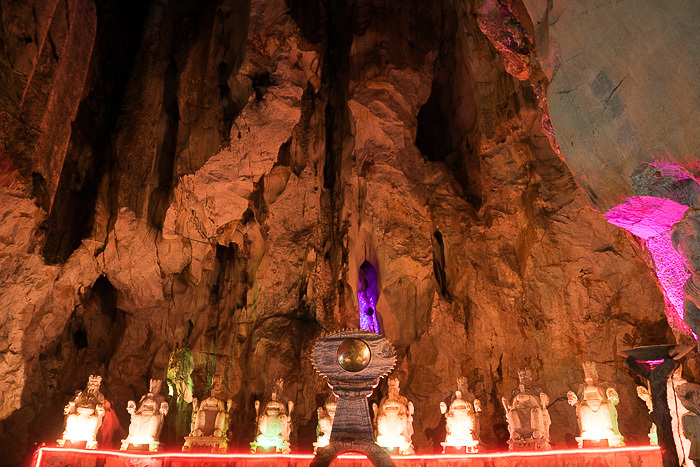 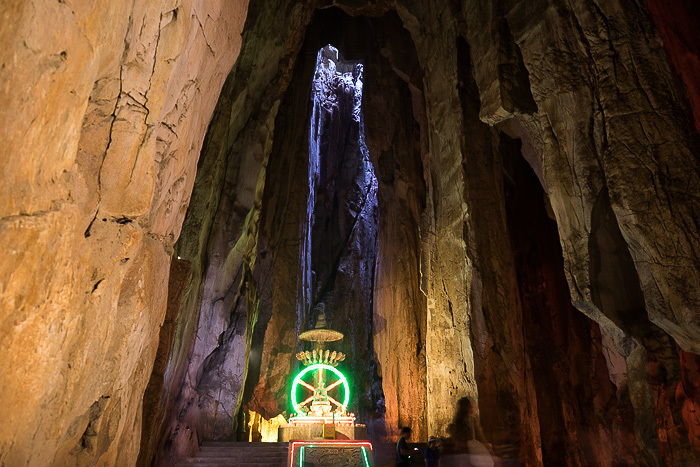 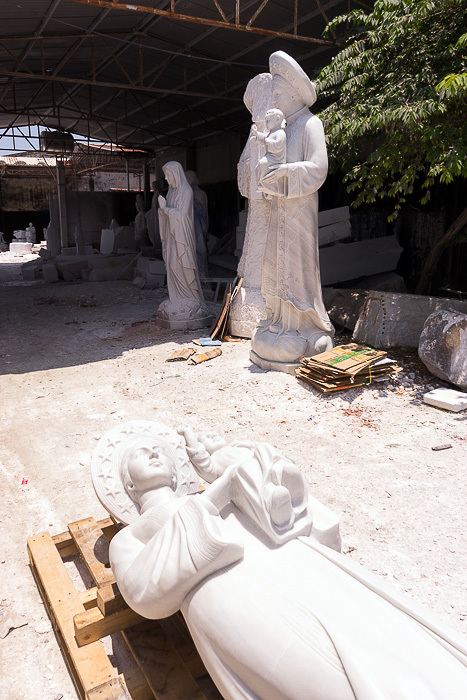 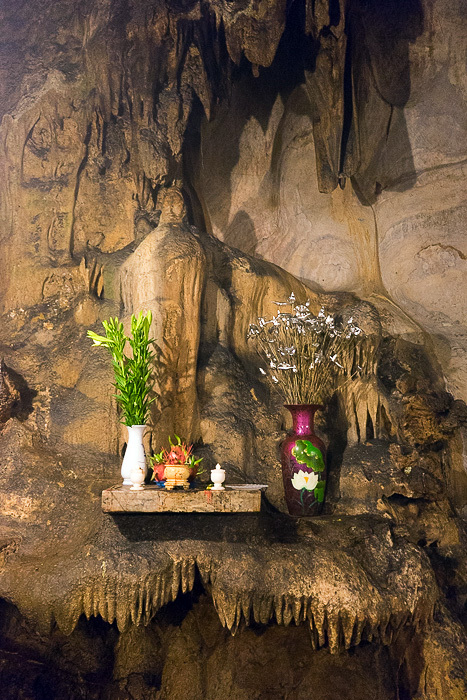 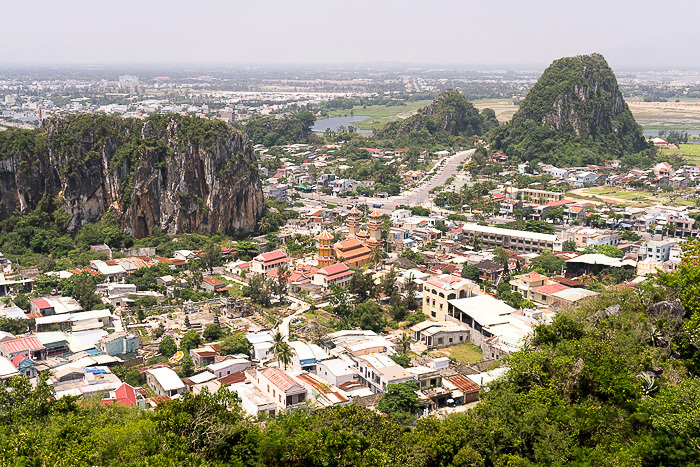 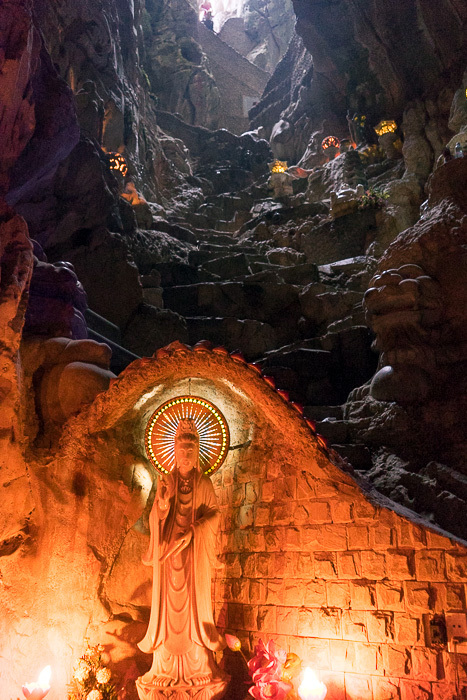 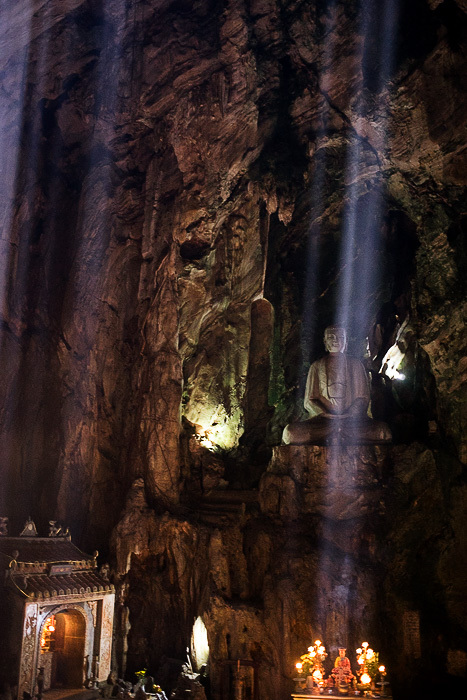 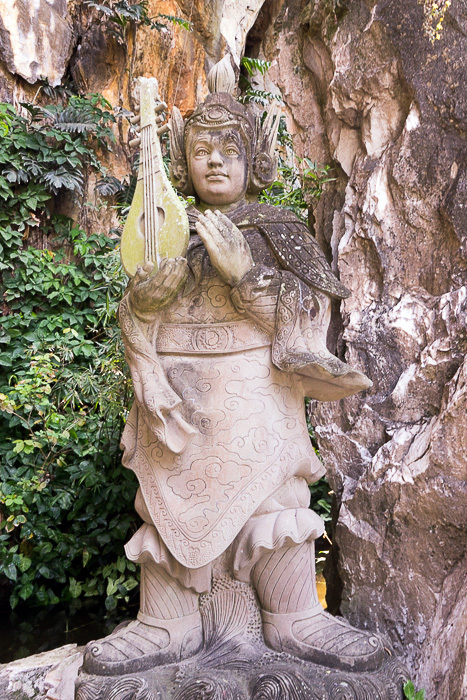 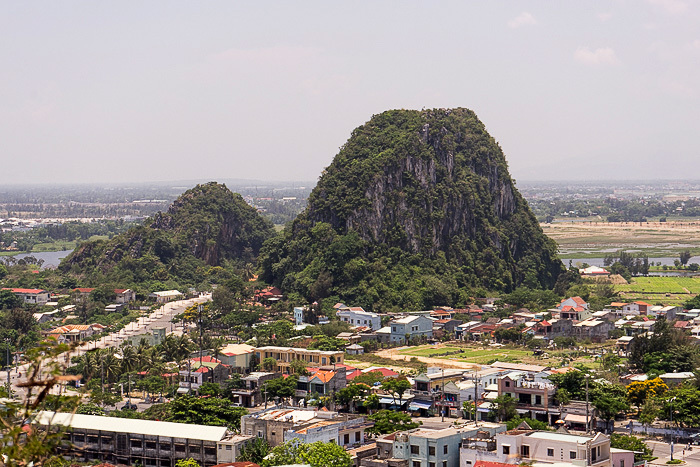 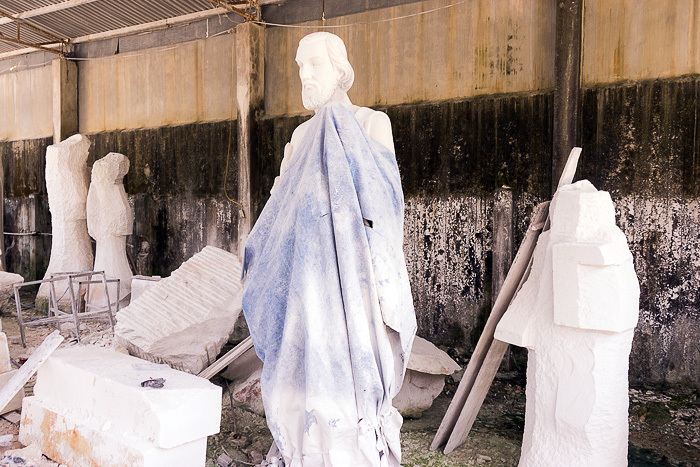 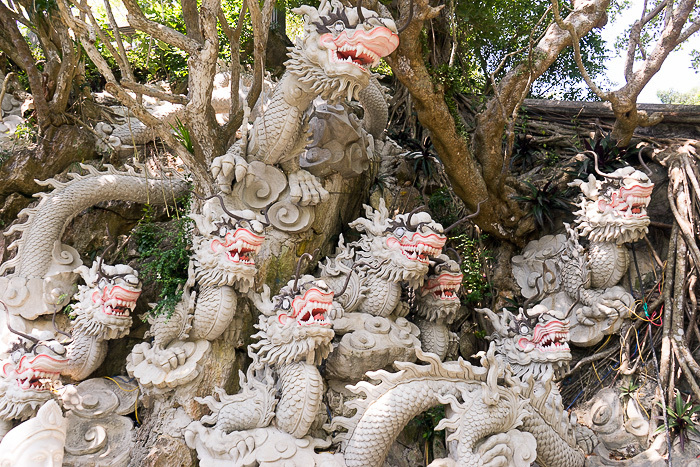 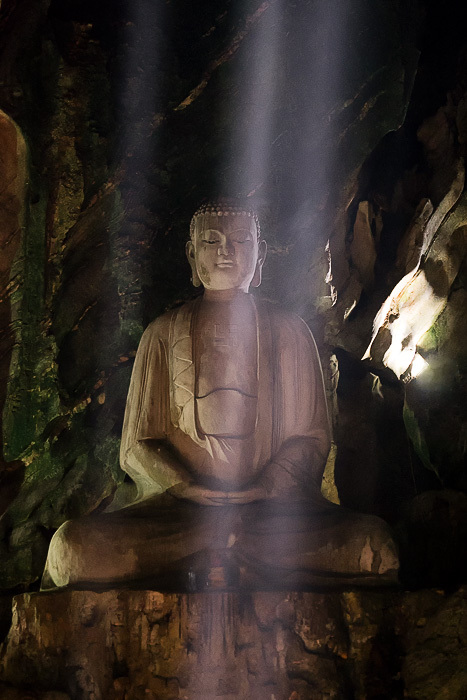 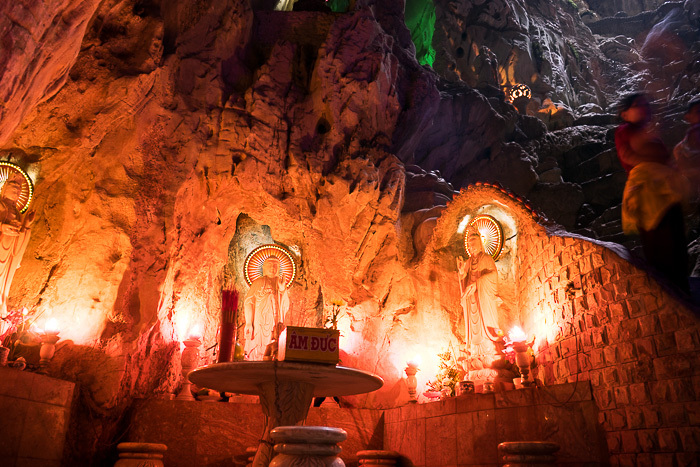 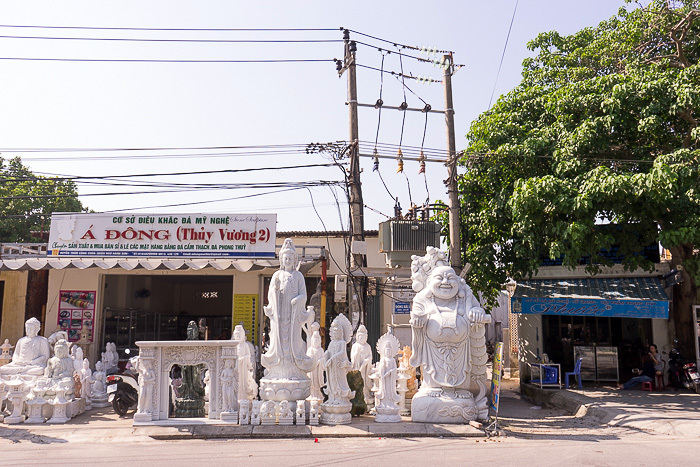 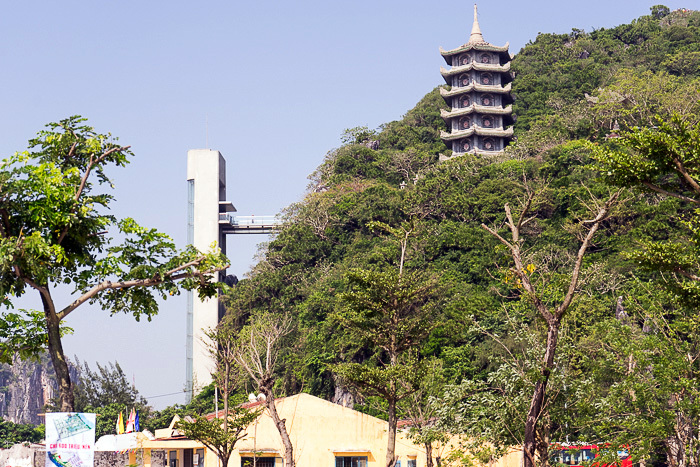 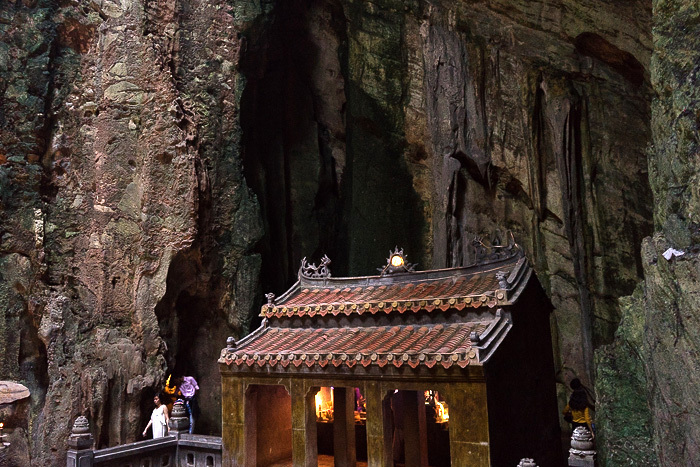 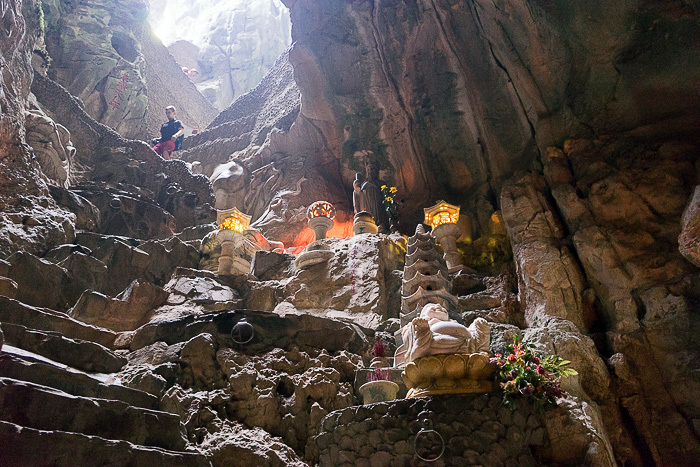 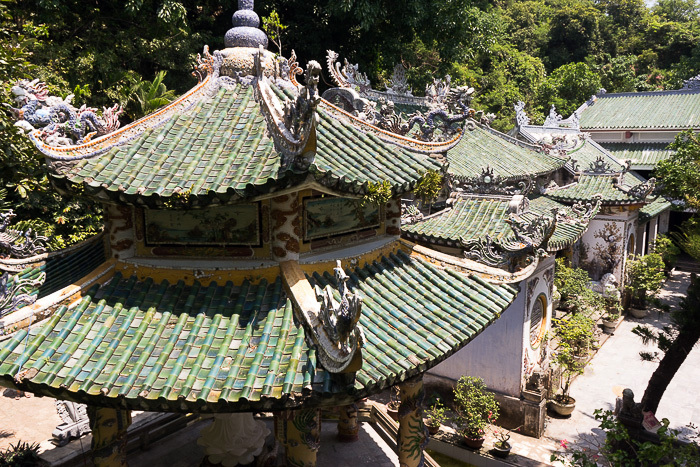 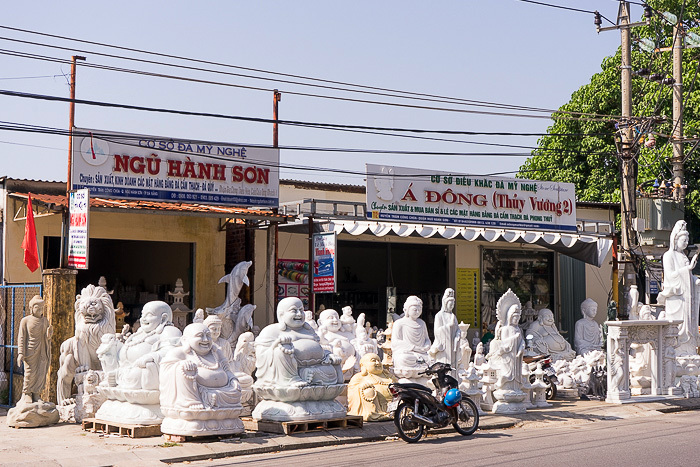 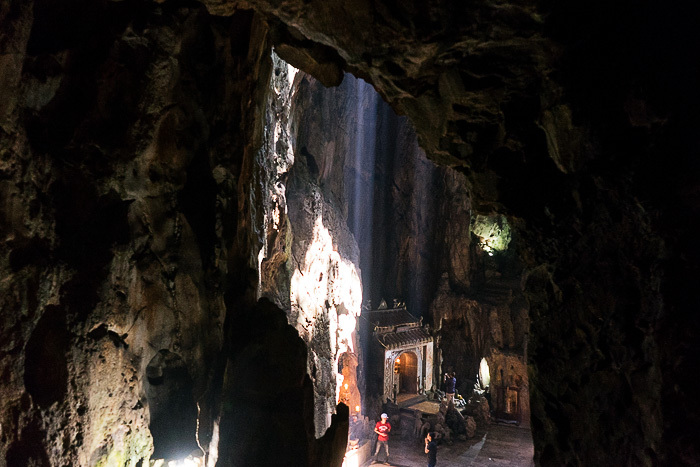 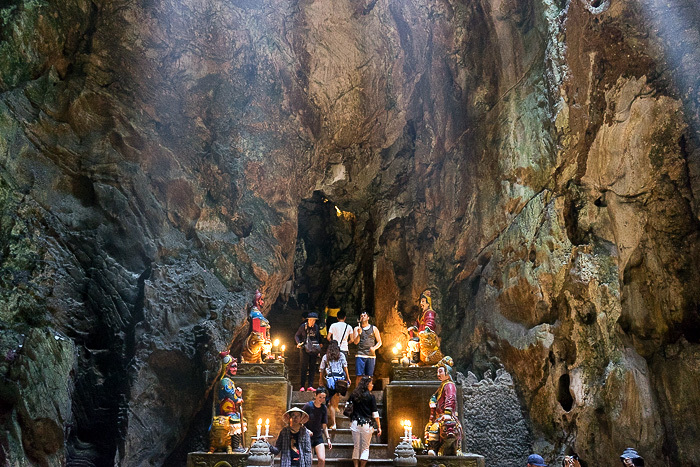 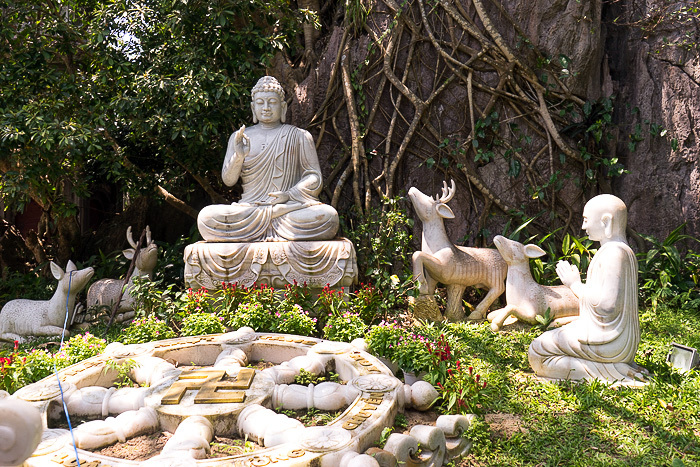 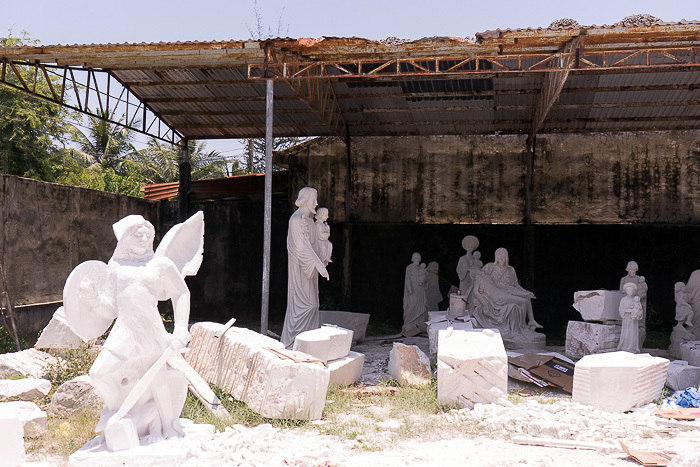 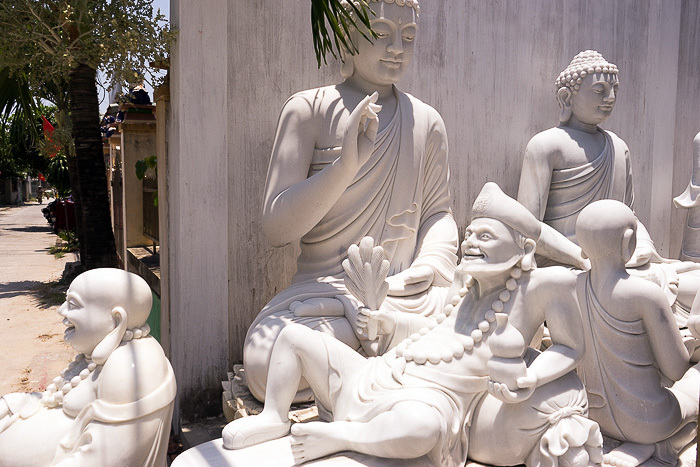 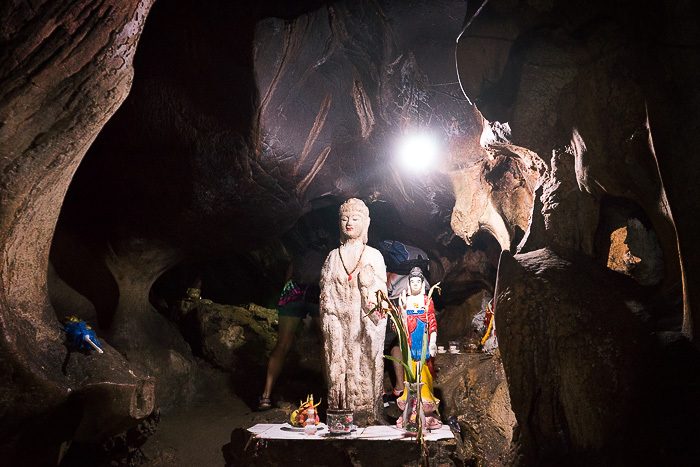 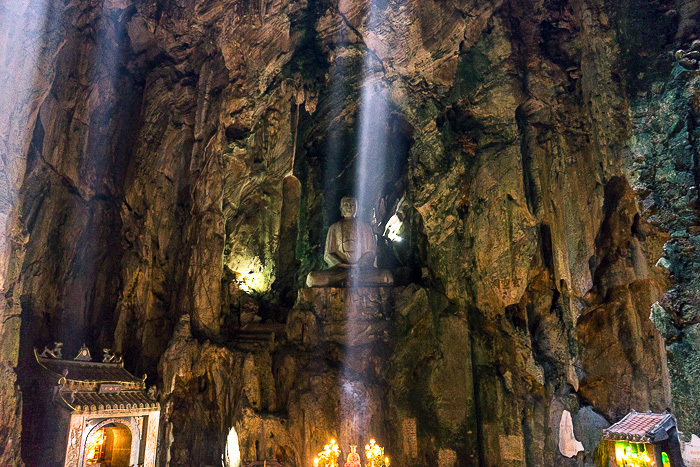 The Marble Mountains have strong religious connotations for the Vietnamese, who have decorated them with dozens of shrines and icons. 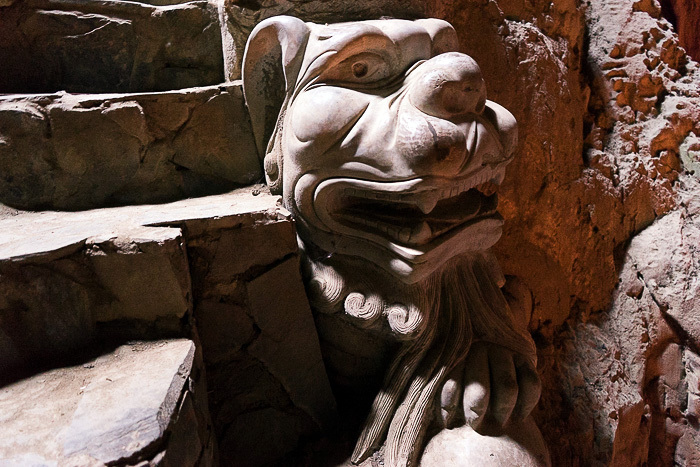 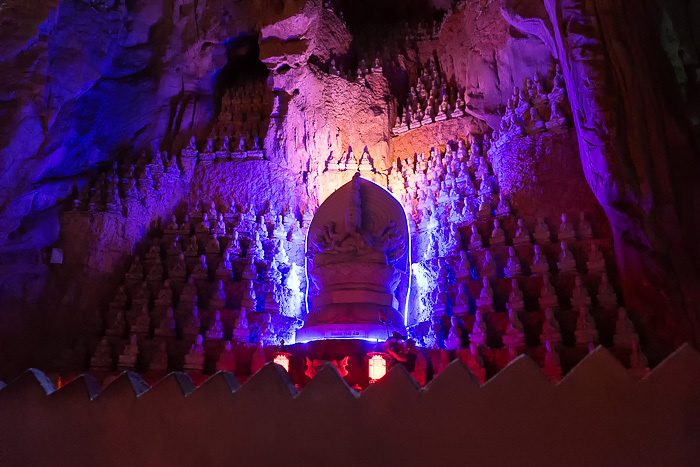 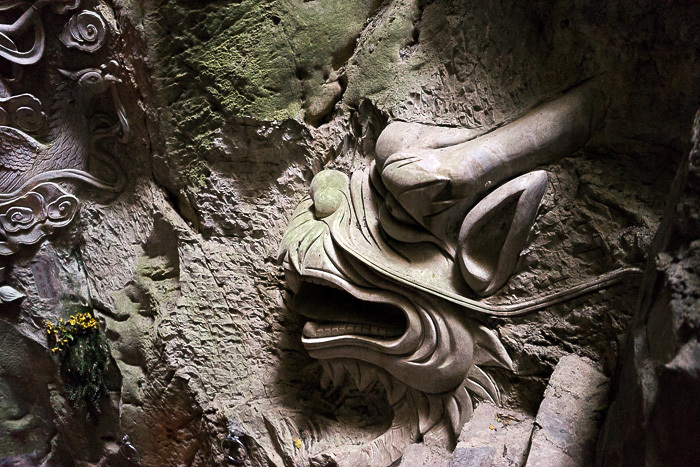 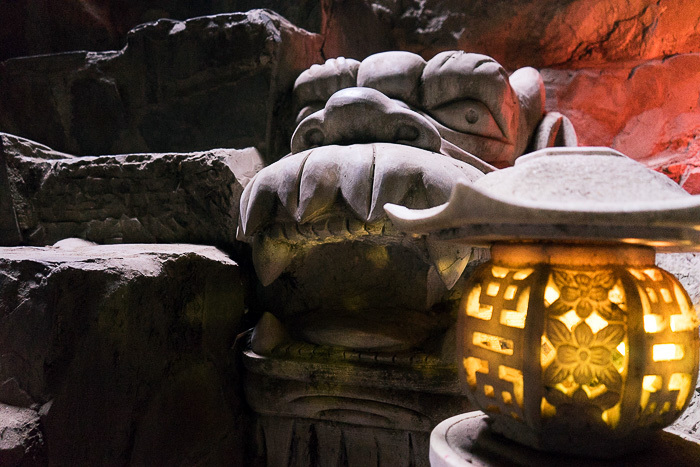 In the lower levels of the first cave, we saw a representation of Buddhist Hell, with sinners being dismembered and tortured by demons. 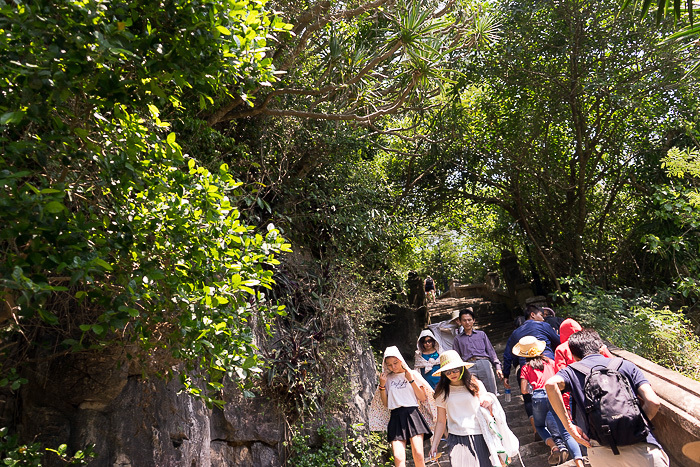 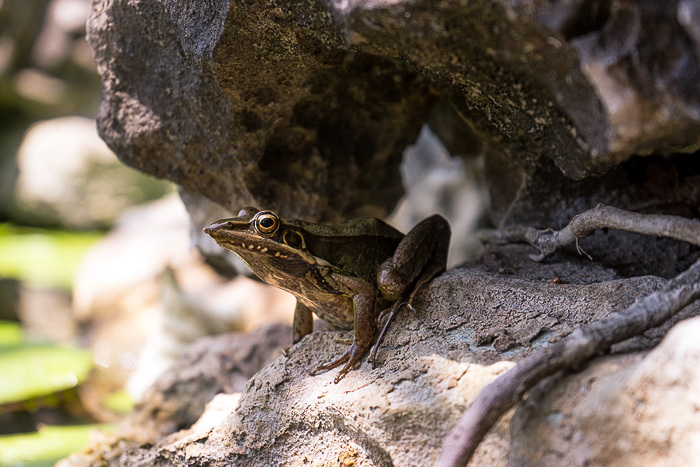 After plunging ourselves into the depths, we climbed a dizzying flight of stone steps to the top of the cave and out into the fresh air, where there was a tremendous view of the coastline. 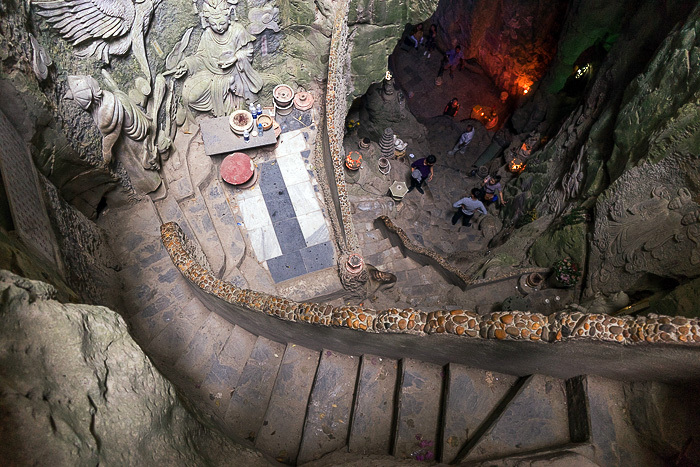 Exiting the cave, we began our real ascent up the mountain, choosing to bypass the new glass elevator installed along the side of the rock in favor of an old-fashioned flight of stairs. 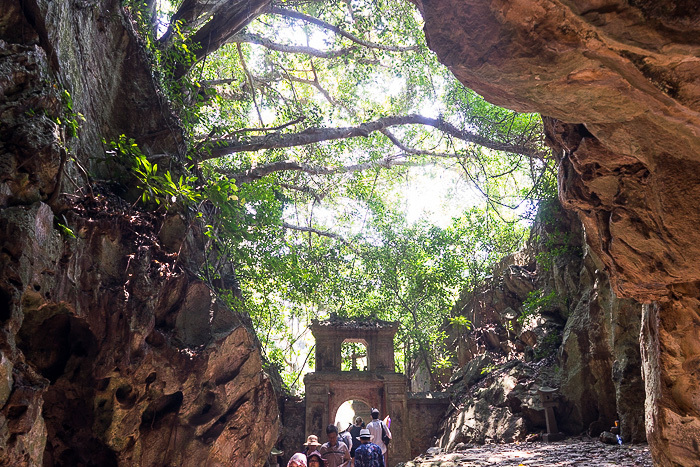 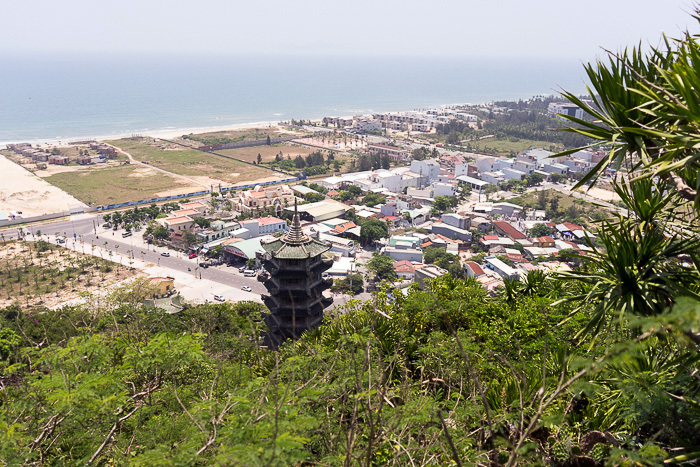 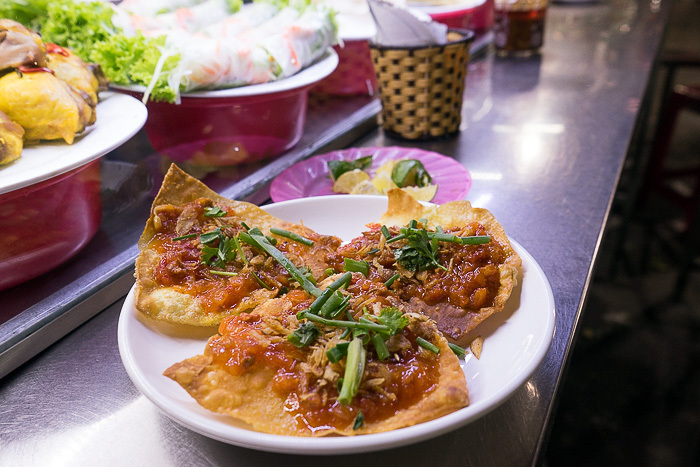 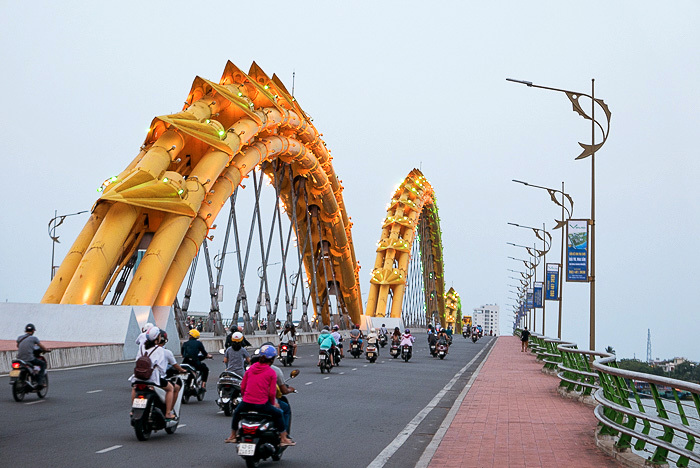 Thủy Sơn is crowded with temples, shrines, viewpoints and vendors, and the number of other visitors was overwhelming. 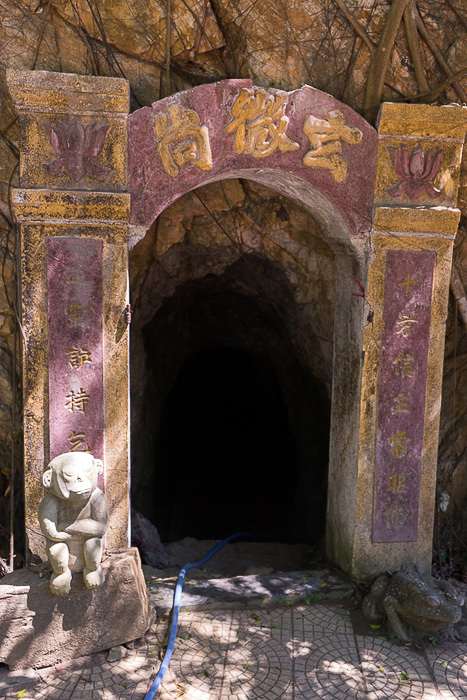 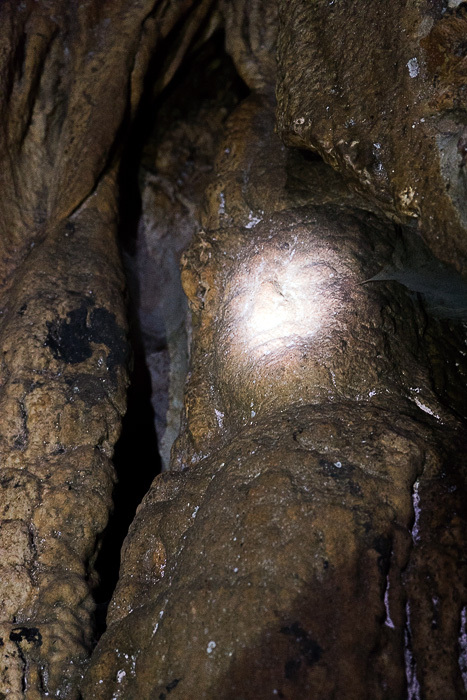 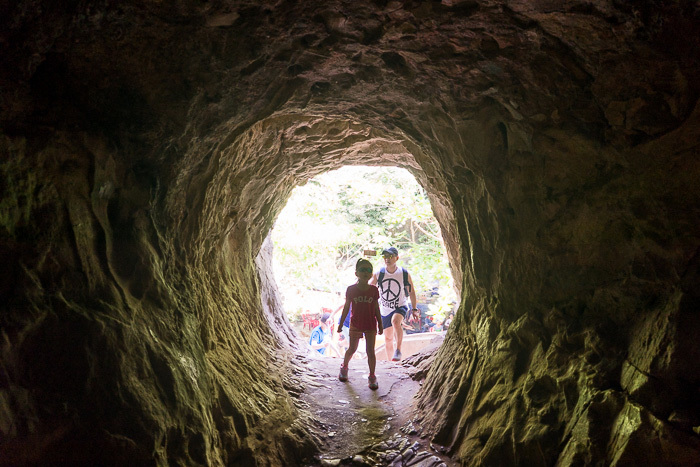 We checked out a couple viewpoints, threw a cursory glance into some temples, and then found the entrance to another cave on the far side of the mountain. 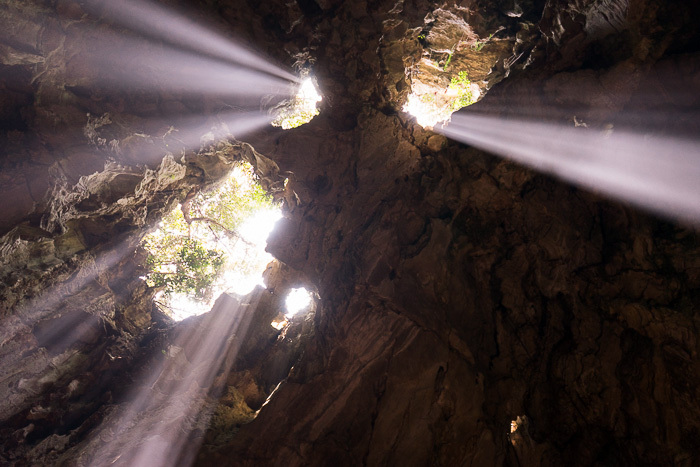 This was even more impressive than the first one, if only because of the two rays of sunlight shining on the ground like spotlights. 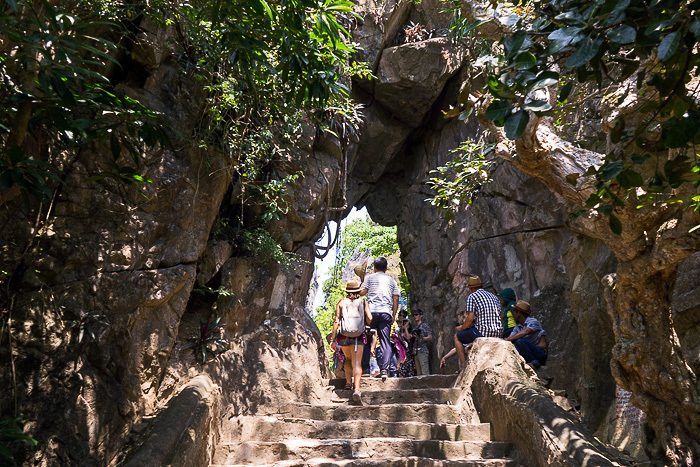 Our original plan had been to check out each of the five Marble Mountains, but Thủy Sơn required so much time, that we had to reconsider. 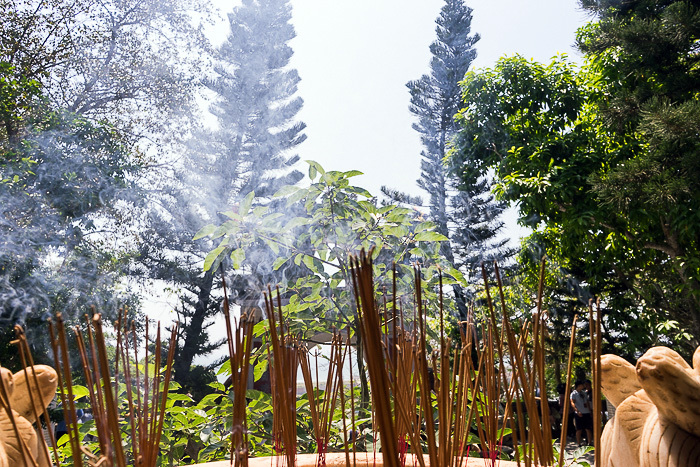 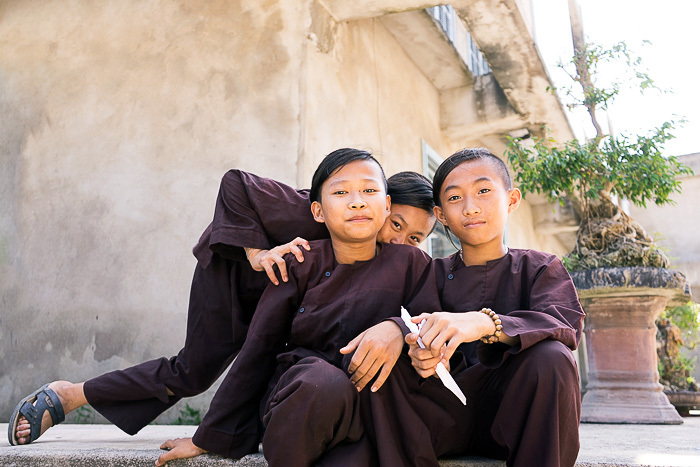 We made a beeline for Kim Sơn (Metal Mountain), and parked our bike next to a group of young monks-in-training. 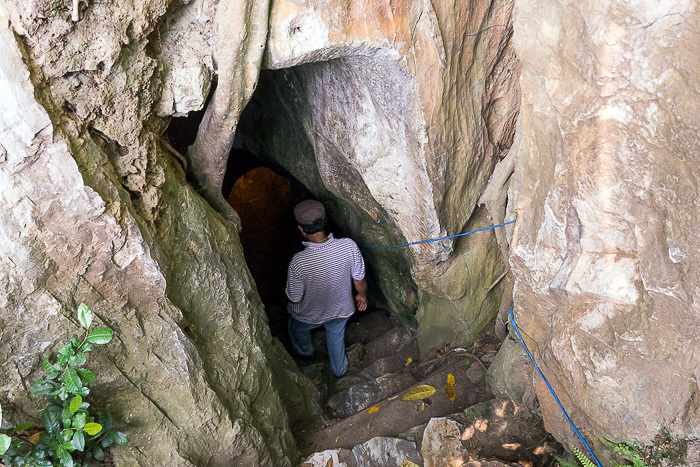 It didn’t take long before a local guide ran over, and offered to take us into two separate caves. 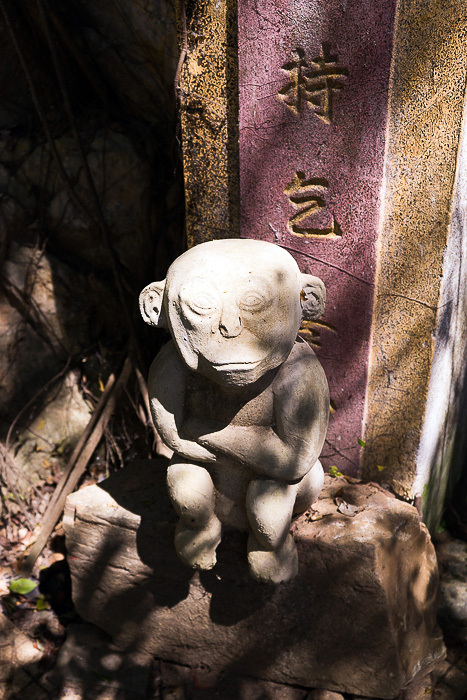 We were able to haggle him down to Đ30,000 apiece for the tour. 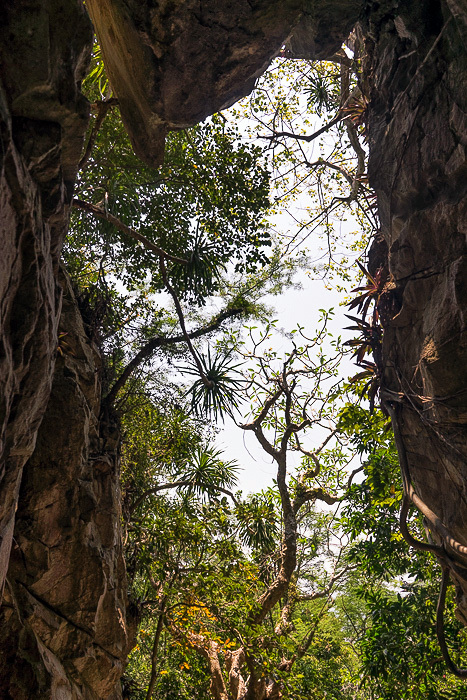 Although neither of these caves was as spectacular as the two at Thủy Sơn, we enjoyed them thanks to the total lack of other people. 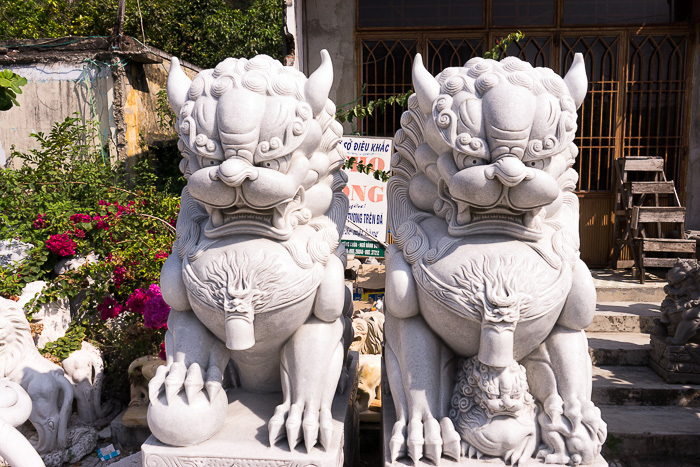 This was a perfect example of something we’d find over and over again during our time in Vietnam. 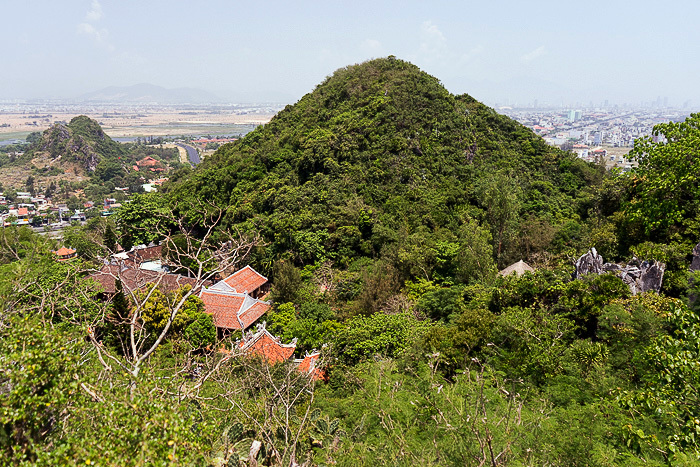 The first mountain, Thủy Sơn, was popular to the point of obnoxiousness, while all of the other mountains didn’t have a single visitor. 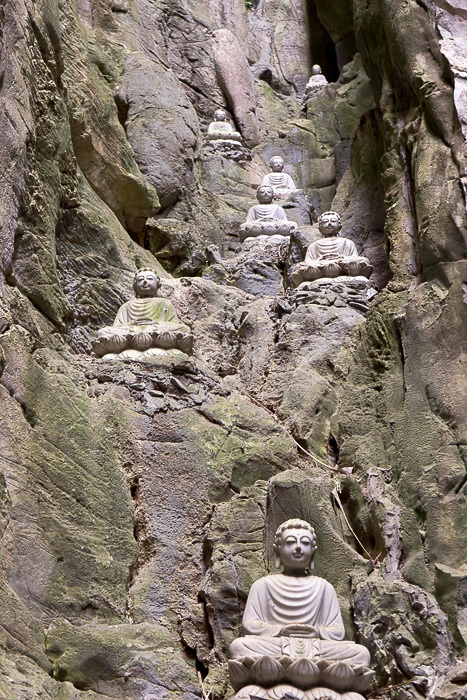 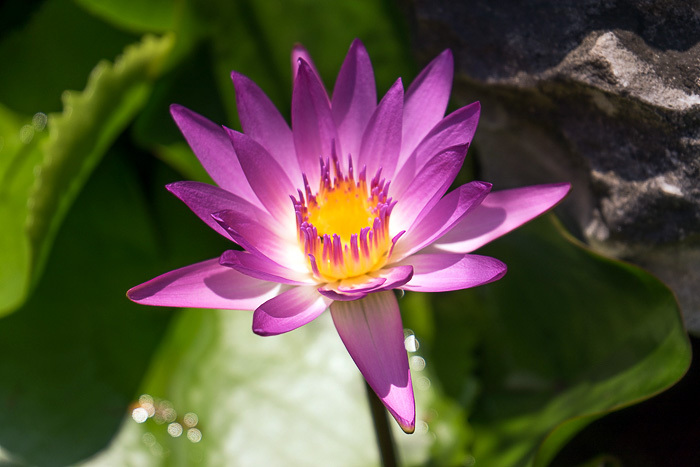 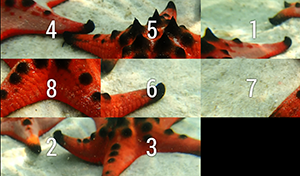 There’s no middle ground; everyone gravitates toward the same experiences. 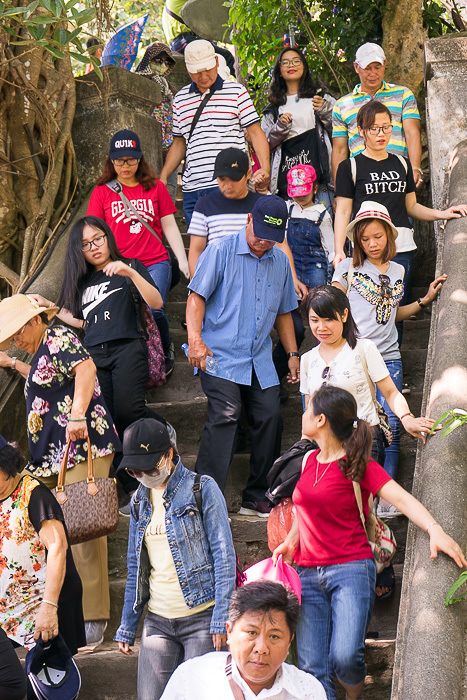 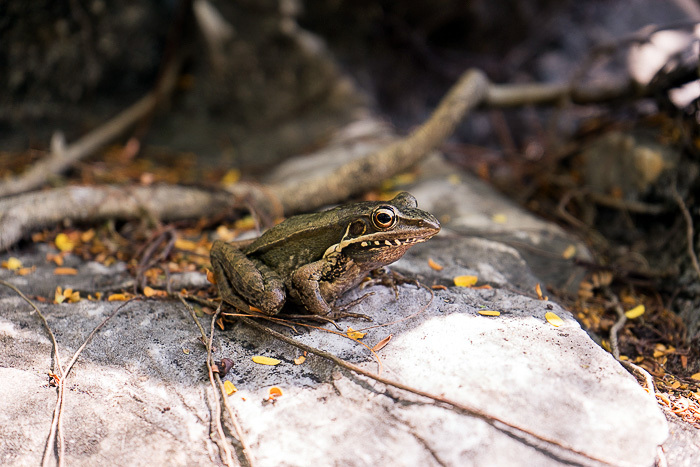 If big crowds are getting you down, just step off the beaten path. 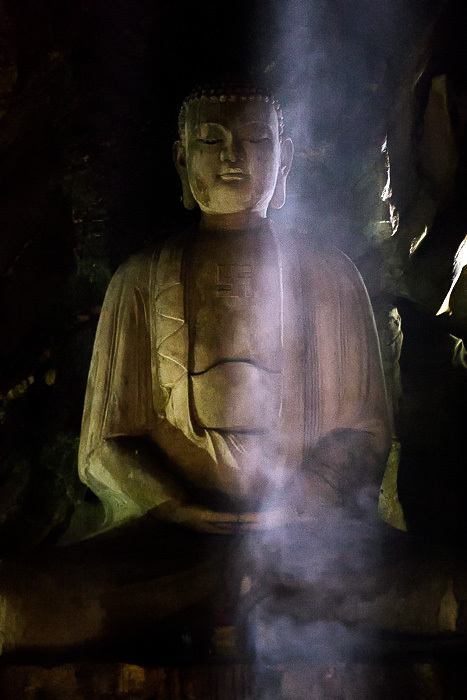 The moment you do, you’re likely to find some amazing solitary moments.